In every aspect of life, safety should be a priority. In the case of welding, it’s no different either. Though according to the trend of the last 10 to 15 years, welding safety is just a theory. Practically it is not maintain correctly. But everyone should value their life & that’s why we felt the necessity to write about welding safety tips, precautions & rules. Every welder should be aware of the risk of welding & understand the safety measure & regulations. Welding is not possible without a live power source. So you are at risk of experiencing an electric shock at any time. Sometimes for massive electric shock people can fall from high which causes fatal injuries or death even. If you are careful & know how to keep yourself safe from electric shock, then there is no risk for you. If you work in a chaotic electric condition, then there is more risk. Follow below safety rules for electrical safety. Before turning on the welding machine, ensure there is no water around the welding machine. Ensure you have sufficient fire extinguisher if there is any source of fire happens. Keep all the flammable materials like liquids, papers away from the weld area. Double check your gloves & protective clothes are not entangled with combustible material. A fire extinguisher should reviewed to check if it updated enough to work correctly. At the welding period, intense radiation happens when a spark produces UV light. Welding creates radiation from between 200 to 1400 nano-meters wavelength. UV radiation has three types. UV-A, which is absorbed in the eye lens. UV-B & UV-C radiation absorbed in the cornea. If there is no proper welding curtain, then you can suffer a condition called ‘Arc-eye.’ This will make a lot of eye twitches & excessive tears. It can damage your vision. Wrong welding distance, angle & long term spark duration can create burn injury. You can use UV protective glasses under your helmet so that when you remove the helmet, you are still protected from other welders. During the welding operation, various type of invisible gas exposure happens which is not good for welder’s health. Gases like nitrogen oxide, chromium, nickel oxides, carbon monoxides may hamper your lungs if it gets inserted into your body. Base on the gas type, this can damage your body for a more extended period. You may suffer Pneumonia, Asthma, Cancer, Metal fume fever, etc. Sometimes combining with UV light, chlorinated hydrocarbons create phosgene gas, which may cause severe sickness. Follow below safety measures not to affect by gas exposure. Use proper clothing- Every welder should wear protective glasses, welding jacket & trouser for their physical safety. Also, hand gloves will protect their hands from burning because welding is involved with a lot of heat. This protective clothes will keep them safe from unwanted burning from all sorts of debris. Always use proper face shielding also. Wear a set of the earplug to stay the hearing safety. Because welding process creates a hard sound which is difficult to bear. Also, earplugs will save your ear from entering sparks from the weld. Welding tools should be used safely & need to keep clean from dirt. You need to maintain adequate distance because some metal may react badly due to lousy contamination. Date expired tools should not be used in the welding operation. Inspect all the related tools before starting the weld. Use suitable respirator for your work. Your respirator may save you from toxic gases that are created at the welding period. If you remove your hand gloves or boot even temporarily, then you are taking the risk of burning. Only remove these when you are not welding. You can’t remove your helmet at welding period. Just after welding finish, you can remove the helmet. Otherwise, the intensity of the radiation may harm your eyes & face. It’ very important to remain behind the welding curtain even if you are not the main welding operator at welding period. Before start welding operation, you need to get appropriate instruction from a person or an institute. These days you can get e-learning courses which are easy & cost effective. Welding workplace should be well ventilated so that gases are not stored in the place. Ventilation strategy is so important because, through proper ventilation, toxic gases & particles are removed from the workplace. Keep flammable materials away from the workplace. Otherwise, spark, heat or molten spatters may put flammable materials on fire. 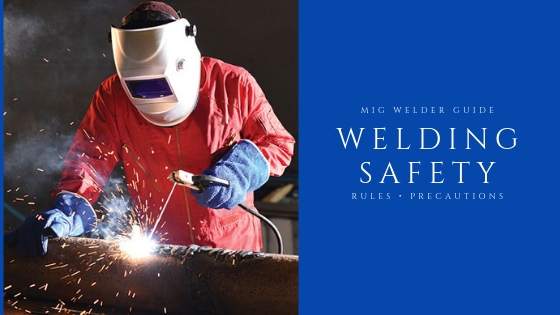 Welding might seem to be a risky job, but if you know the rules & precautions, then it is safer for you. Knowledge should apply practically. Otherwise, it will not help you in real life situation. Never overestimate yourself. Always keep in mind, safety is an investment for a healthy & happy life. When your health & life in danger, you should not consider anything less than required. It is important to also note that www.migwelderguide.com is a participant in the Amazon Services LLC Associates Program, an affiliate advertising program designed to provide a means for website owners to earn advertising fees by advertising and linking to amazon.com, endless.com, smallparts.com, myhabit.com, and any other website that may be affiliated with Amazon Service LLC Associates Program.